Large algae seaweeds known as kelp have been able to float some 20,000 kilometres (12,427 miles) from the southernmost reaches of the Indian and Atlantic oceans all the way to the shores of Antarctica – a trip previously thought to be impossible. Not only is it an incredible journey, it's the first hard proof that Antarctica isn't as isolated as scientists thought it was. This has implications for climate change, Antarctic wildlife, and even floating aeroplane debris. The international team of scientists who spotted the 'foreign' kelp have now put together a computer model showing how the seaweed might have made its impossible journey. It could significantly improve our understanding of how conditions on the Antarctic continent might change in the future. "This is an unequivocal demonstration that marine species from the north can reach Antarctica," says one of the team, Crid Fraser from the Australian National University (ANU). "To get there, the kelp had to pass through barriers created by polar winds and currents that were, until now, thought to be impenetrable." The kelp was discovered washed up in spots including the shore of King George Island, with the seaweed now the holder of the farthest biological rafting event ever put on record. 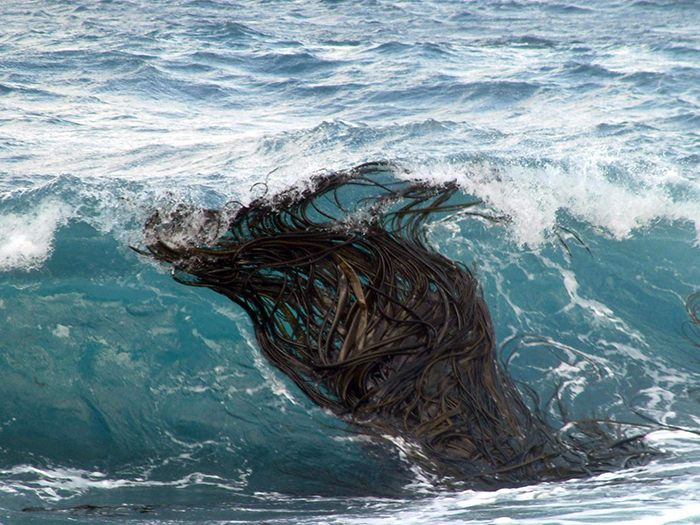 The kelp essentially surfed on the waves, according to the researchers. Based on the most up-to-date analysis of ocean currents and westerly winds, plant-life like the kelp would be expected to be pushed in the opposite direction rather than drifting south. It turns out that Antarctic storms are the missing part of the equation. The large waves whipped up by storm events are enough to override the default patterns and bring kelp drifting to the edges of Antarctica, the new models showed (see the video below). As each big wave passes, the kelp surfs forward a little bit. "Once we incorporated wave-driven surface motion, which is especially pronounced during storms, suddenly some of these biological rafts were able to fetch up on the Antarctic coastline," says one of the researchers, Adele Morrison from ANU. "If plants and animals get to Antarctica fairly frequently by floating across the ocean, they will be able to establish themselves as soon as the local environment becomes hospitable enough." Kelp often carries other plants and tiny creatures burrowed inside as it floats across the waves, which means an impact on the Antarctic ecosystem that hasn't been factored in before now. It might also mean the continent is more vulnerable to climate change than previously thought, with warming temperatures meaning more types of plant and animal life can start to thrive around the ice. The new models might prove useful in tracking all kinds of other objects across this part of the world's oceans as well – the plastic that we keep dumping into our oceans, for example, or even aeroplane wreckage. "These findings could change the way we model oceanic surface movement," says one of the team, Andy Hogg from ANU. "If this wave-driven surface motion - known as Stokes drift - influences the movement of particles around Antarctica, it could be important for other stormy seas too." Scientists continue to discover more and more about the remote wilderness of Antarctica. A lot of the signs aren't good – the speed at which the ice is melting in response to rising temperatures, for example, increasing the risk of global sea level rises. Some research is more encouraging though: earlier this year researchers found a supercolony of some 1.5 million penguins, thriving far away from human influence. The new discovery promises to help us understand Antarctica and its relationship to the rest of the world better than ever before, but we might not necessarily like what we find. "If those [kelp] rafts can make it this far, we could soon see massive changes in Antarctic intertidal ecosystems," says Erasmo Macaya from the Universidad de Concepción in Chile, who first found the travelling kelp.